How does it help you, the student, job seeker, teacher? Regardless if you are an employee, looking for a job, or trying to help students secure employment, the most common question people will ask is, "What software do you know how to use?" You want to be able to answer that question by saying you know how to use the most popular software in the industry. Why? Because it will increase your chances significantly. Let's say there are 1,000 machine shops in your area and 500 use Software A, 50 use Software B, 50 use Software C, 50 use Software D and so on. You have 10 times better chance to get a job if you know how to use Software A, than any of the other Software products. When looking to learn how to program CNC Machines, it's important to learn the most popular CAD/CAM software which is Mastercam. 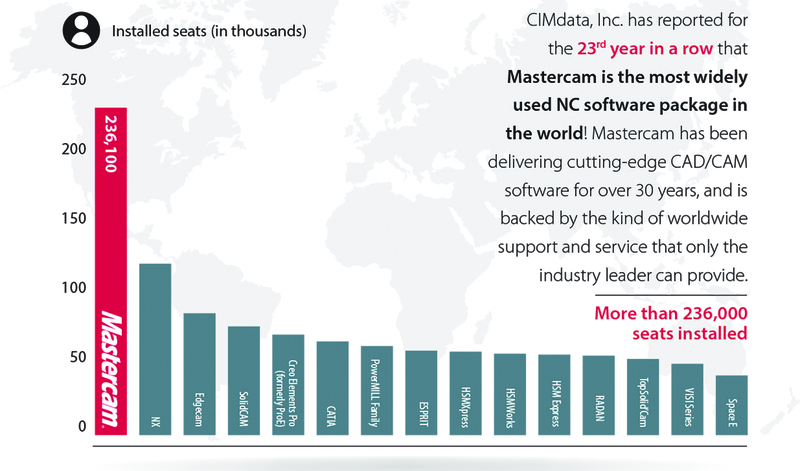 "Make the right choice when learning Mastercam" site.